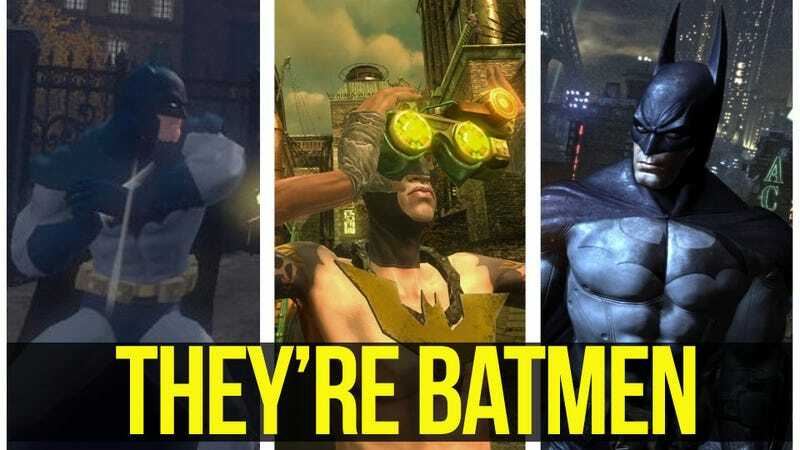 When I first heard about Gotham City Impostors, this lifelong Batman fan got very nervous. Part of it comes from the way the game's premise rubs up uncomfortably against Caped Crusader canon. "Batman doesn't use guns!" my inner fanboy cried. (Except that he did in his earliest appearances.) "And there's no way that he'd allow amateur vigilantes—especially ones that use guns—and evil clown wannabes to roam through his city!" Gotham City Impostors sports a more exaggerated art style than the detailed hyper-realism of RockSteady Games' latest Bat-outing. More worries. This is going to be a disaster, I thought. However, my thinking on that's changed. The more I thought about Impostors, I was able to put some of my fanboy fears to rest. Why? Because the game serves as a reminder of where Batman comes from. and the fact that, when it comes to the ways that the character's been portrayed, Batman is legion. He contains multitudes. The 1950s Batman comics had him and Robin adventuring in broad daylight with a lighter, boys-adventure tone that diverged wildly from the gothic shadows of his first few outings. And then, for TV watchers of a certain age, Adam West's campy Caped Crusader will always be their touchstone for the character and the comics made while the 1960s Batman TV show was on the air followed that interpretation's lead. Comics readers and Bat-observers know the rest: how a young Denny O'Neil and Neal Adams brought the character back to its pulp influences in the 1970s, followed by Frank Miller's gritty bookends The Dark Knight Returns and Batman: Year One in the 1980s. The point, of course, is that multiple interpretations for Batman aren't anything new. What's new is that video games are just now getting to the point where they can reflect the multivalent potential of Bruce Wayne's masked alter ego. Shortly after Batman: Arkham Asylum came out, Warner Bros' game division released Batman: The Brave and The Bold, a side-scrolling action title that tied into the popular Cartoon Network show. And, as part of a heroic triumverate with Superman and Wonder Woman, Batman figures prominently in the DC Universe Online MMO, too. He's slightly chattier, friendlier and willing to be a mentor. A different guy than in Arkham City, but the same, too. So, if you're scared like I was, take a deep breath, fellow Batman fans. As good as Arkham City is, there needn't be one Batman to rule them all. Gotham City Impostors won't invalidate Arkham City, especially since Batman's out of town in the former game. Instead, it's evidence that we just might be entering where gamers of all ages and tastes—kids, FPS players, character creation enthusiasts—will have a Batman game they can enjoy.